I can’t believe I’m already able to say this, but tomorrow marks the one year anniversary of my first blog post! I honestly never envisioned myself as a blogger until that first post was published. I knew having a blog would be a plus when applying for jobs, but I never thought I was an “expert” in any particular subject area. Also, as it turns out, blogging on a consistent basis can be quite the commitment! So how did I end up with this website that I’ve devoted countless hours to? Well, it all started out as a portfolio site for a college class during my last semester at San Diego State University. We had to create a portfolio site on WordPress with a home page, about section, a resume and any work samples from our field-related courses. This website was originally created on the Journalism and Media Studies school’s intranet, but I had the option of exporting the site onto my own public WordPress site once I had graduated. I decided to do this mid-May of 2016, but felt like there was something missing. When I realized that WordPress gave me the option to having a blog site, I thought that I might as well go for it! 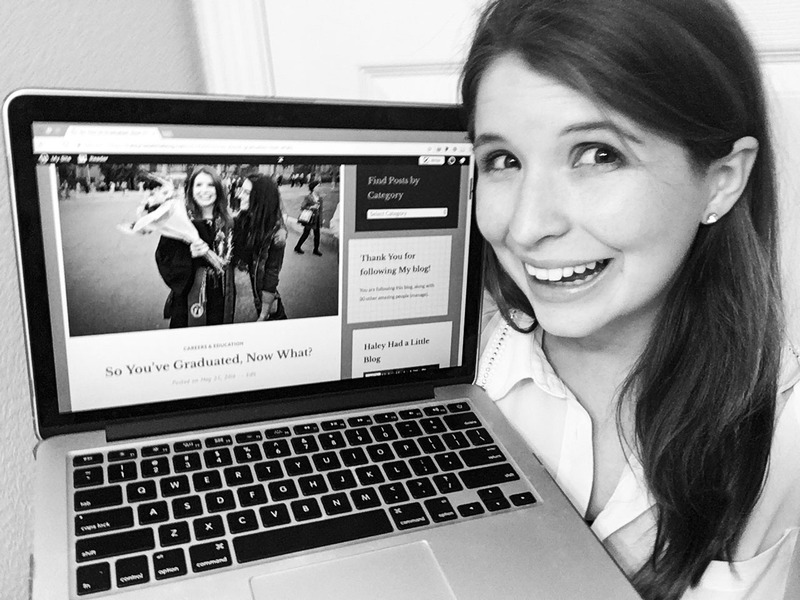 I wrote my very first blog post, “So You’ve Graduated, Now What?”, and published it on May 25, 2016. It was this initial post that has paved the way for #WeeklyPostWednesdays. Since then, I’ve learned so many things about blogging and know that I have so much more to learn in the future! Up until this point, I didn’t have a niche for this blog! I don’t cook very often, I don’t really travel all that much and I’m not a big fashionista. I kept racking my brain about what the heck I was going to talk about. I figured I would just start writing about things that I was passionate about and then go from there. As time went on, I started to realize that many of my blog posts had a common theme: I was giving advice from my own past mistakes and experiences. I never intended to become the next advice columnist, but I do enjoy sharing my self-taught epiphanies with others. I slowly started to realize that there were many life lessons that I learned at quite the early age, and those lessons spanned across different areas of my life. Whether it was about school, work, relationships or life in general- I’ve had advice to give. These lessons might have always been in the back of my mind, but I never realized how much I’ve learned from them until this last year. #2: Planning Ahead is a Must! To keep this blog operating on a weekly basis, I have to plan ahead! Lately, I haven’t been doing a great job at this, but I plan to get back on track with my planning process as soon as my certificate program ends. Typically, I give myself weekly blogging goals to put myself ahead of schedule. I typically pick each topic four weeks ahead of time, write a rough draft three weeks ahead of time, make the infographic two weeks ahead of time and take a cover picture/make any final edits one week ahead of time. I do this so that if I have an incredibly busy week, I’ll at least have something done for the blog posts ahead of time. This system helps me out a lot! I’m currently a little behind on it, but do plan on catching up as soon as possible! I probably would not have been able to keep this blog going for this long if I didn’t have an efficient system in place. Coming from someone who works in marketing and advertising, I knew how important having a cohesive brand was. I also knew that I wasn’t ready to completely brand my “product” yet, so my branding was something that grew over time as well. I originally started with a free WordPress site, which meant that I didn’t have my own domain name. Some of you don’t remember, but the old site used to be haleydanielsblog.wordpress.com. I also had a cheesy logo that I “designed” out of drag and drop pieces on one of those make-your-own-logo sites. I knew my branding wasn’t where I wanted to be, but I also knew that I would have a better presence as time went on. Joining the Interactive Media Certificate Program back in September actually really helped me with this! I was able to create a new site name, logo, and branding package all from scratch around November. Now haleyhadalittleblog.com has a custom logo, a hexadecimal color guide and even its own font! I plan on redesigning the website this summer as well to give it a more clean and polished look! In this era of digital marketing, it’s incredibly important to interact with your followers and customers instead of delivering one-way communication. Having knowledge of this already, I wanted to make sure that I created some kind of community with my blog posts. This meant engaging with my readers by enabling comment sections and creating a Facebook page. We’ve all seen where comment sections can go wrong, so it can be very scary turning those on in your accounts! Despite this gamble, I knew it was important. I also started #TellMeTuesday, where I ask my readers a question every Tuesday that is related to that week’s blog topic! I post it on the Haley Had a Little Blog Facebook page and on my personal Twitter account. Just by doing that alone, I’ve learned so much from you guys! You even have your own advice that has not only helped me, but has probably helped other readers as well. If you’re planning on starting your own blog, just make sure that you don’t underestimate the power of engagement! I think this has been the one lesson that I’m still trying to grasp. For some reason, certain topics tend to do better than others! It’s great to look at the data for marketing purposes, but sometimes this can be completely unpredictable. Some weeks I will put my heart and soul into a topic, and it pretty much flops. Other weeks I might rush a topic and feel guilty about the quality of it, and it does great with my audience! It can be pretty frustrating at times, but it’s more mind-boggling than anything else. I’ve personally found that my blog posts about relationships and career/college advice do overwhelmingly better than my other topics. Also, sometimes certain posts don’t do great at the time of posting, but do better in the long run. For example, my post, “The Turtle: My Spirit Animal”, continues to do well to this day and I honestly cannot find reasoning behind it. I’m not complaining, don’t get me wrong! I just really don’t know if it’s been shared on another site, or if just that many people are typing “turtle spirit animal” into google each month. My point is, try not to get too wrapped up in this, but use your topic performance as an indicator of what your future posts should be about. I am so grateful for this blog and for my readers! This blog has helped me share any wisdom that I do have and it’s helped me get through some rough times this past year. I highly recommend starting a blog if you enjoy writing like I do. I can’t wait to see where the future will take haleyhadalittleblog.com! Many of my posts are also featured on My Trending Stories, so please feel free to check out my stuff there as well! Thank you everyone for your support and if you ever have a topic idea, please feel free to contact me at haleydanielsblog@gmail.com! What’s something new you’ve learned since last year? I have really enjoyed reading your weekly blog Haley! It brightens my week! I’ve enjoyed your blog Haley! Also, I really like the new changes to your webpage! Very nice!